Jan Bruegel was born in the family of the great Flemish painter Peter Brueghel the Elder, and therefore from early childhood was surrounded by people whose vocation and destiny was painting. Young Bruegel also felt a craving for drawing and began to study painting first with his father, and then with Abraham Jansens and Peter Chutkind. Until 1596 Jan Brueghel the Younger lived in Italy, where he took lessons from famous artists, and after his return to his homeland he was accepted into the guild of the painters of Antwerp. Thanks to the peculiar manner of writing Jan Bruegel began to be called Velvet. Subsequently, he became the head of the democratic direction in the art of the Netherlands. At the beginning of the 17th century, the realistic tendencies of the democratic trend were strengthened, which now could withstand the court-aristocratic genre. It was in the genre of realism that Jan Bruegel the Velvet worked. Due to his characteristic sensitivity to nature, he made a great contribution to the development of the traditions of Dutch landscape painting. Painting “Landscape” artist finished in 1603, now it is stored in the State Museum. A. Pushkin in Moscow. This work belongs to the number of innovative works of that time, in it the artist managed to achieve genuine perfection. In the painting, Bruegel portrayed the daily life of the Flemish village, in which everyday themes intertwine with the landscape. The composition has a panoramic view due to the high position of the horizon, while the landscape becomes real. Bruegel portrayed people engaged in everyday work, and everyday scenes did not receive him a sublime or allegorical value. Jan Bruegel Velvet left behind a great creative legacy. The artist drew landscapes, flowers and animals, as well as paintings on religious and allegorical subjects. Jan Bruegel often collaborated with other artists, and therefore in some paintings, although they are signed by Brueghel, it is sometimes difficult to detect the handwriting of the painter. 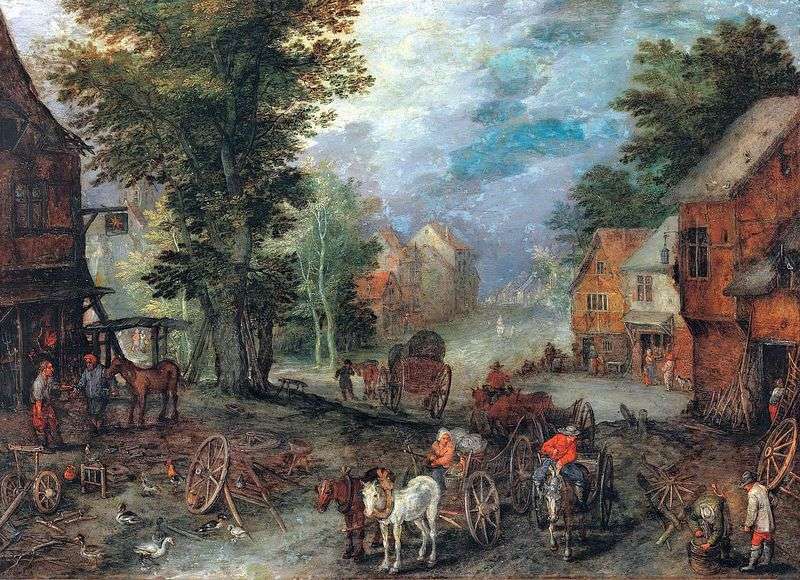 Description and meaning of the painting Landscape by Jan Brueghel.